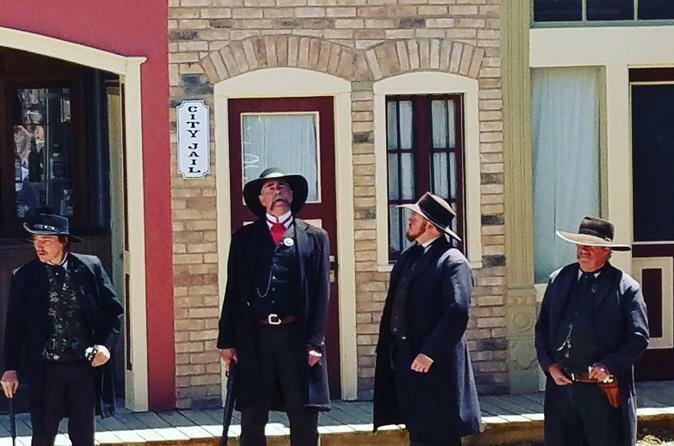 Walk around the famed Old West town of Tombstone and see how the Wild West once was. Witness a gunfight at the historic O.K. Corral and later, enjoy lunch in the area. Get a chance to walk onto a movie set where over 400 television and movies were filmed at Old Tucson. Obtain great photos of the Saguaro Cactus in its natural splendor at Saguaro National Park. Duration of tour is 12 hours from pickup to drop-off . Lunch, admissions and a Gun Fight is included. Pickup will be at 7am from the hotel lobby. From here we will take the 3 hour trek to Tombstone, AZ. During the trip down you will learn about the area and historical information about the state from the guide. We will transport you in a luxurious SUV for the trip. Once in Tombstone you will get a chance to roam around and check out the amazing main street of the old west town. Also here we will take you to lunch and a staged 30 minute gunfight. Total time in Tombstone is around 2-2.5 hours. From here we will take you to the popular film studio of old Tucson. There you will get a chance to explore the historical film lot of where over 450 productions were filmed. We will spend roughly 90 minutes in this location. Lastly we will take you to the amazing viewpoint and visitor center at Saguaro National Park. We will spend 30-40 minutes at this location. From this stop we will promptly take you back to the hotel. Total trip is 12 hours from pickup to drop-off. Lunch, admissions and a staged gun fight is included.